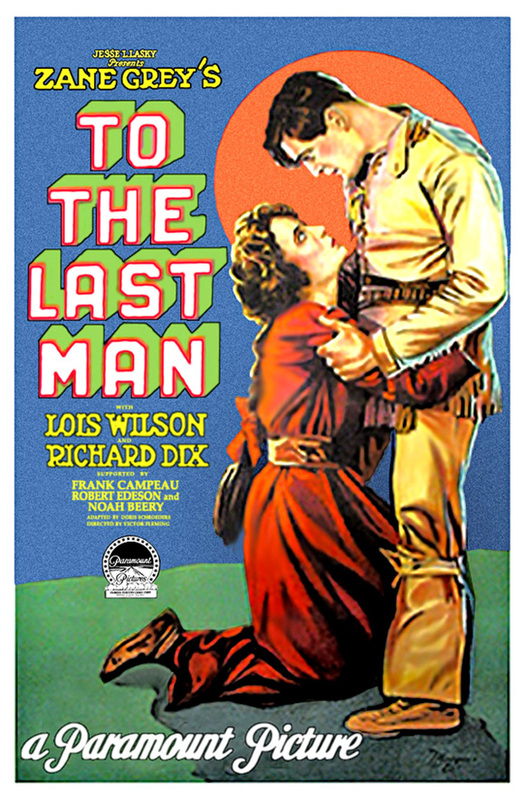 Lou Lumenick, the cheif film critic for the New York Post, recently blogged about a Zane Grey film called “To the Last Man”. The majority of the article is analysis and praise of this obscure 1930’s Paramount film, but he also discusses the “Public Domain Hell”. His discussion of the Public Domain is brief, but it is raises interesting questions about the nature of a (hypothetical) healthy Pulic Domain. In the second paragraph of his post, Lumenick laments that “a significant number of titles that have fallen into that gray area many film buffs call Public Domain Hell.” He doesn’t elaborate on that statement, perhaps because most of his readership fall into the “film buff” demographic. Later in the post, however, Lumenick elaborates. He explains that when a film enters the Public Domain it usually doesn’t get restored. The film can be legally copied, so there are a lot of poor qualities floating around. The studios can’t justify the cost of restoration, because once they restored the film it could be legally copied and distributed. Lumenick’s interest is apparently in having high quality prints of obscure movies available, not having those films open to remix and reinterpretation. Films that enter the Public Domain don’t get restored, so Lumenick would apparently prefer that they don’t enter the Public Domain. Lumenick praises Paramount’s ability to reclaim the copyright to “It’s A Wonderful Life” and offer exclusive access to NBC, which justified the “considerable cost of restoration”. Lumenick’s doesn’t analyze the merit of the Public Domain, he simply laments the fact that films in the Public Domain rarely get restored. His post made me wonder how a healthy Public Domain would function. If works were routinely entering the Public Domain, which ones would we value enough to restore? Would we restore any of them? It seems that the Public Domain would preserve those films that the public values. If the public has access to them, and values them, then they can be catalogued and organized and protected from abandonment. That may apply to the relatively easy process of scanning books, but it may not apply to films. Scanning books is relatively cheap and yields a high quality copy. The process of restoring a 35mm print is tedious and expensive, which makes it difficult to crowd source the way book scanning can be. Perhaps the films would enter the Public Domain, only to be lost due to lack of preservation. Lumenick argues that Paramount won’t restore films that are in the Public Domain because once they released the DVD of the remastered “To the Last Man”, it could be copied endlessly. However, if Paramount, or anyone else, instead restored the film and made additional 35mm prints, they could still sell the physical prints to film buffs and museums. This apparently is not enough incentive to restore an obscure film like “To the Last Man”, but what if the film in question was a Paramount classic like Hitchcock’s “Rear Window”? (interstingly, ownership of most of Hitchcock’s films, with the exception of Psycho, reverted back to him) If “Rear Window” had entered the Public Domain, and no high quality copies were available, would someone have restored it? If Paramount hadn’t “rescued ‘It’s a Wonderful Life’ from PD Hell”, would it ever have been restored? If works entered the PD on a regular basis, who would preserve them? Would it be econcomical to preserve them? Would we gain access to thier intellectual property only to lose them to physical degregation? This brings up some interesting questions regarding the length of copyright protection for different forms of media. You point out nicely that different issues plague films moving into the public domain than other forms of media (and even other movie forms, such as those shot with digital technology) due to the great expense of restoring a print of film. One might wonder then if a different sort of analysis should go into determining the length of copyright protection for film as compared with other forms of media (and even as compared with other forms of movie production, such as those shot using digital technology). This is indeed a tricky question. In the future (the distant future, based on how the copyright term lengths have been repeatedly extended), having movies and music all recorded in digital copies would eliminate this problem. When a film is nothing more than a collection of zeros and ones, there’s no degradation that can occur (besides actually losing part or all of the file, which shouldn’t be a problem if it’s properly backed up). Until then, however, we have to deal with whether a film should be in the public domain or be restored. For an obscure film, I don’t think a movie corporation would bother restoring it even if it were not in the public domain, since the amount of profits they could make from it wouldn’t cover the costs of restoration. So, a film like that should remain in the public domain. For popular films, the solution isn’t as clear. Perhaps, as you said, the restored copies can be sold to film buffs and museums who aren’t likely to distribute the film for free to others – that way those who really want the restored version will pay for it. One of the reasons that the vast majority of silent films no longer exist is that most of the were not considered to have sufficient value — even BEFORE their copyrights expired — to justify the cost of proper storage, let alone restoration. Something that was considered an obscure film in 1950 might be of greater interest now, and the list of public-domain films contains dozens of movies that are now considered “classics.” I would like to see the fair-use doctrine more precisely defined and expanded, but there are definite benefits to the public from copyright protection. If the 75-year copyright term had been retained, King Kong, to cite one famous example, would have entered the public domain in 2008. While artists would have been free to remix and reinterpet, the market would have been flooded with poor copies, as they were during the period when It’s A Wonderful Life was in the public domain.